Despite the efforts that the government and other related organizations have put into the series of problems, they certainly did not do a great job of protecting the citizens and environment, more importantly, the authorities are not open for detailed information at all. After five years, they tried to persuade people to believe that everything has passed already. Meanwhile, the collected contaminated water also brings a huge problem: how to isolate all the radioactive substances from it? While most of the substances have been removed after “painstakingly cleaning”, tritium concentration remains at high level as it is extremely hard to separate. On the other hand, the water body and marine ecosystem are facing huge contamination problems caused by the leak. Although the clean-up works have showed their positive effects, the radioactive contamination is going to “stay put near Japan,” according to marine radiochemist Ken Buesseler of Woods Hole Oceanographic Institution. To view the results (problems) of Fukushima accidents from a brand new angle, the future of scientific research comes into play. An article published online in Nature on March 2, 2016 provides a valuable insights into the problem. As a well-known resource-poor country, Japan absolutely needs nuclear power’s support in order to reduce greenhouse-gas emissions. Since the accident in 2011, the article points put many of those decisions on evacuation, clean-up and so on were made at “the science–policy interface.” and “scientists, especially those involved in giving policy advice, lost credibility and the trust of the public” due to all the concealment described in previous paragraphs and continuous arguments raised by people with opposite interests. The article states that the tragedy happened in 2011 has revealed a “fundamental problem” presents in Japanese scientific research field that the connections ” between disciplines and between Japan’s scholars and those working in other countries” are weak. Overall, although two articles have taken completely different aspects of the Fukushima power plant, both admitted near the end of its work that problems “abound” even after five years of the disasters. That isn’t to say that these little grey shirted dudes across the world are at fault or to be judged (we all are little grey shirted dudes ourselves at some point), but it is something to think about how the scope of “science” is understood and perceived differently within the general public. In many instances, science intimidates people. There is a fear, a distance, and an uncertainty about it. After all, most adults never have another incentive to study or understand science after high school, and many people write themselves off as not fit to learn or even take an interest in science based off of bad early experiences. However, with a better cultural understanding of what science is and how it works works, people stand better chances of being able to accurately interpret and approach the information that gets thrown at them on a daily basis. It’s an issue that scientists and educators are actively trying to tackle, and of course, a primary ambition of science journalism. Only recently have I realized that there is a vibrant community dedicated to initiating and understanding this sort of communication. 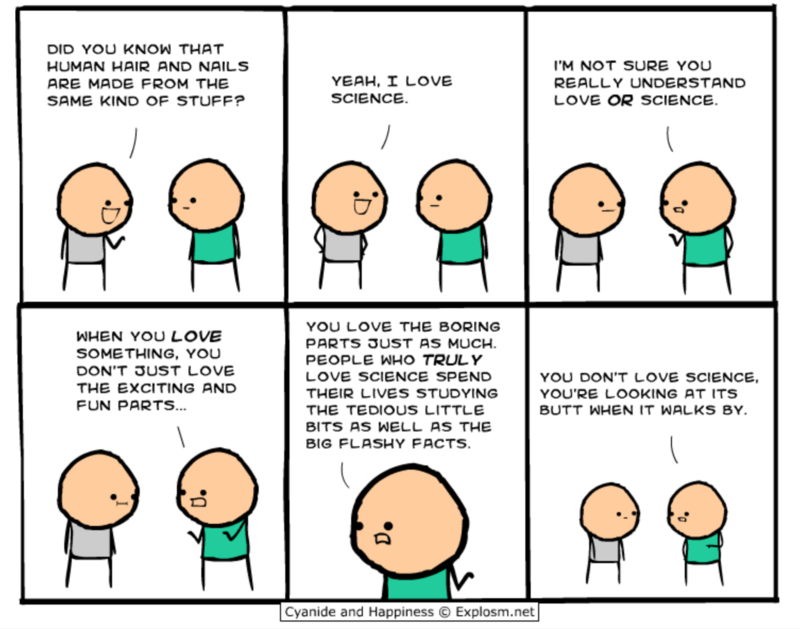 Actually, “Science Public Engagement” is a HUGE thing. There exist professional agencies that function purely to aid scientists in communication, radio shows (a local Boston one) that intertwine science and comedy, and citizen science projects with an initiative to get regular people involved as contributors to real science research. There was even a national conference last month dedicated to the theme of Global Science Engagement and science policy (which by the way is coming to Boston next year). A ton of scientists, journalists, and educators are out there collaborating on innovative ways in which non professional citizens can engage into a deeper understanding of science. So we need to think, as scientists and educators, how do we make science not threating, accessible, and meaningful? To get people involved in science, we need to give them the experience of being a part of the science themselves and to show them that it is an important part of their lives. Circadian rhythm is the 24-hour physiological processes throughout a light/dark cycle. In other words, how your body responds to daylight/nighttime. It’s obvious to say that (most) people wake up in the morning feeling energized, to then feeling like napping (or taking a siesta) in the afternoon, to being awake again later in the night until you eventually fall asleep. Remarkably, this activity pattern is conserved across many species, down to rodents and even fruit flies- yes, those teeny, tiny flies feeding on your bananas at home. So, why is this even a concern? Altered activity patterns and disrupted sleep is seen in many neurological diseases and psychological disorders. Seeing the same characteristic in different health conditions is unlikely a coincidence, suggesting your “biological clock” is somehow associated with your mental health. To further investigate what really goes on, scientists need to turn to a simple model organism for their research experiments, such as the fruit fly Drosophila melanogaster. Sitaraman, D., Aso, Y., Chen, N., Felix, M., Rubin, G.M., and Nitabach, M.N. 2015. Propagation of homeostatic sleep signals by segregated synaptic microcircuits of the Drosophila Mushroom Body. Current Biol 25:2915-2927. Seidner, G., Robinson, J.E., Wu, M., Worden, K., Masek, P., Roberts, S.W., Keene, A.C., and Joiner, W.J. 2015. Identification of neurons with a privileged role in sleep homeostasis in Drosophila melanogaster. Current Biol 25:2928-2938. Larkin, A., Chen, M., Kirazenblat, L., Reinhard, J., van Swinderen, B., and Claudianos, C. 2015. Neuroxin-1 regulates sleep and synaptic plasticity in Drosophila melanogaster. Euro J Neurosci 42:2455-2466. Mazzoccoli et al., 2016. A Timeless link between circadian patterns and disease. Trends Molec Med 22(1):68-81. Abruzzi, K., Chen, X., Nagoshi, E., Zadina, A., and Rosbash, M. 2015. RNA-seq profiling of small numbers of Drosophila Methods Enzymology 551:369-386. Move Over Biopsies…Make Way for the Spit Test! With surprising accuracy saliva can point to head and neck cancer. Researchers from the Johns Hopkins University School of Medicine identified tumor DNA in the saliva. The DNA contains distinctive mutations associated with cancer and makes it easy to identify. As a tumor sheds parts of its genetic code into its surroundings, some of the DNA will be incorporated into the saliva allowing for detecting. Currently, there are no screenings for head and neck cancer because it does not improve the mortality rate of those types of cancer patients; so the saliva test could possibly increase survival chance through earlier treatments. However, this study has one major flaw. The results obtained were not compared to healthy individuals, so the effectiveness of the spit test is still unclear. More research needs to be conducted to determine if this test is worthwhile, but at its current stage, it seems to be very promising. The cluelessness of vaping; so whats the buzz? Vaping, which was recently added to the dictionary in 2014, is becoming a new craze. “Vaping” is essentially the new term for “smoking”, you “vape” an e-cigarette and “smoke” and cigarette. It is the inhalation and exhale of vapor containing nicotine or other chemical substances, produced by an electronic cigarettes or similar devices that are battery-operated and use a heating element to heat a liquid cartridge. “Vape” juice is made of nicotine mixed with a base (most often propylene glycol) and flavorings. The growing popularity is increasingly fast, especially amount young adults. There are hundreds of brands, thousands of flavors, but they are all unregulated by the FDA. This raises a few questions: what chemicals are people exactly inhaling if this product is unregulated? Can’t people say one thing and it be another? What are the health’s affects? We don’t know if the second hand smoke from an E-cig is less, just as, or more dangerous than that of a cigarette. Nicotine is also an addictive substance. There are a number of affects nicotine has on the brain in terms of development, memory and retention, and behavioral and cognitive behaviors. Recent studies show noticeable amounts of cancer causing chemicals, such as formaldehyde from the heating up of propylene glycol. There is so little known about E-cigarette smoking, at least in the public eyes, there needs to be something done. The public is unaware of the full health effects of electronic cigarettes. There are too many potential consequences to keep a blind eye to it. With no safety checks and requirements, anything goes and often people do not understand what they are consuming. Why vape when there is not an understanding of its consequences? Restrictions and warnings need to be put in place. Any way you light it, not smoking at all is the best way to go. It is commonly thought that mental stimulation will decrease the risk of developing Alzheimer’s disease. However, researchers from Mayo Clinic found that for the majority of the Alzheimer’s population keeping mentally and physically active will only slow the progression of symptoms, not the actual disease. In the longitudinal study 393 participant, between 70 and 89 were asked to report their mental and physical activity and were then imaged to look for Alzheimer’s disease progression. The study specifically look at the APOE4 gene in this study. APOE4 is an allele of APOE (apolipoprotein E) increases the risk of developing late-onset Alzheimer’s disease and associated with an earlier onset. APOE is involved in making a protein that carries cholesterol and fat int he bloodstream. The study found those who had the APOE4 gene not only showed a decrease in Alzheimer’s symptom progression but also a decrease in progression of the actual disease in certain parts of the brain with mental and physical activity. Do not count out mental and physical stimulation just yet. There has been many studies that support how lifestyle enrichment helps delay onset of cognitive impairment and it helps prevent other disorders such as diabetes. Since you already have your phone out or computer screen up, take a moment and check how many Facebook friends, Twitter and Instagram followers, and whatever other social media connections you have. Cacioppo, a Professor at the University of Chicago, has been investigating loneliness pathology and its public health consequences for over two decades. In the early 1990s Cacioppo introduced the scientific community to a new field, social neuroscience, and has since demonstrated the importance of understanding and analyzing the need for stable bonds within social species, namely the human race. Seemingly counter-intuitive, Cacioppo has found that “often times, fewer is better” when it comes to the quantity of one’s connections. Some people have countless networks yet feel lonely because of the increased likelihood that motivations (of material gain, for instance) can impede true connection. Cacioppo’s findings have could advocate for public health and policy reform. The incidence rate of loneliness is high: one in four people regularly feel lonely. Early death by factors related to chronic loneliness is increased by 20%, the same rate as those fatal factors related to obesity. Though a direct cause-effect relationship between loneliness and heart disease and cancer can’t be drawn, there are serious health implications including sleep fragmentation and poor immune system function. What does this research mean in the context of mounting social media use? Roughly two-thirds (65%) of American adults use social networking sites. Both the 18-29 and the 30-49 age brackets have seen increases. The latter group has increased from 8% to 77% social media users since 2005, and compared with a mere 12% in 2005, 90% of young adults are on social media. What could this mean for the prevalence of loneliness and related health consequences? Is there a decrease in confidant quality associated with a growth in social media? Perhaps the use of “social” as a modifier for media is as ironic as your friend’s Facebook post of a “Forever Alone” meme.